I first became aware of Jeffery Hayzlett when I saw this video – http://www.youtube.com/watch?v=YYriUxcAz4Y&feature=related. This was a kind of CMO I’d never encountered before – and frankly was just exactly what a company in as dire straits as Kodak needed. Because Hayzlett is nothing if not a salesman. And you know what makes a really great salesman? Content. Substance. Something important to say that matches one’s skill in saying it. And that’s what, in the end, makes this video so compelling. And while his book “The Mirror Test: Is Your Business Really Breathing?” has some valuable advice about being a salesman, one wishes it had a little bit more of the substance that makes a great salesman like Hayzlett great. Or at least, more than it does. Unlike me, you may know Hayzlett from his time on “The Celebrity Apprentice”, and so may be less surprised than I was that he drew so sparingly from his time at Kodak, and instead focused more on lessons learned from the early part of his career running a chain of print and copy centers in the Upper Midwest. It is this experience that serves as the bedrock to his most important points, chief among them that you have no company if you have no customers. And that, in a nutshell, is the mirror test. As a result, the value of this book is primarily in that grass-roots, no-nonsense, back-to-the-basics focus. For entrepreneurs just starting out, the book is a step-by-step, real-world look at business – one that at times debunks some of the more abstract pronouncements of other works in the field – and that at times simply echoes them in refreshingly plainspoken language. But “The Mirror Test” also has value for those in bigger companies, because it serves as a great reminder that no matter how many floors above the street your desk is, no matter how many far-flung countries your company has outposts in, business still comes down to a transaction between two human beings. And amidst all the meetings, conference reports, memos and emails, it gets remarkably easy to forget that, doesn’t it? The problem however, is that Mr. Hayzlett’s book is too thin. And while I’m a firm believer that brevity is the soul of wit, there’s a disconcerting feeling that this book is being padded. This is most painfully felt in chapters eight and nine in which Mr. Hayzlett launches into a discussion of social media. Now, social media, I think we can all agree, is important. And while I will cut him some slack because the social media landscape has evolved mightily since the book was written in 2010, it’s still disappointingly true that his comments and insights about it are remarkably basic. More troubling, however, is that they don’t seem to be connected to the general tenor of the rest of the book. Yes, having a social media strategy is important. Yes, perhaps more important than a grass-roots small business entrepreneur thinks he has time for, or than a C-suite 50-year-old executive understands. But these two chapters feel uncomfortably as if they were tacked on from a different presentation. And that just adds to the sense of padding that is so disappointing. Now, I spend a lot of time teaching marketing and advertising. And by-and-large the kids who sit in these classes have never sold anything in their lives. Their relationship to the actual sale – the thing that all marketing and advertising is built on – is theoretical and abstract at best. And I would be willing to bet that this is true of most marketing students and indeed most people in business. One only wishes that Mr. Hayzlett had used his salesman skill to deliver more of these messages, and that they were more fully developed. Who knows what sales he might have taught people to close. 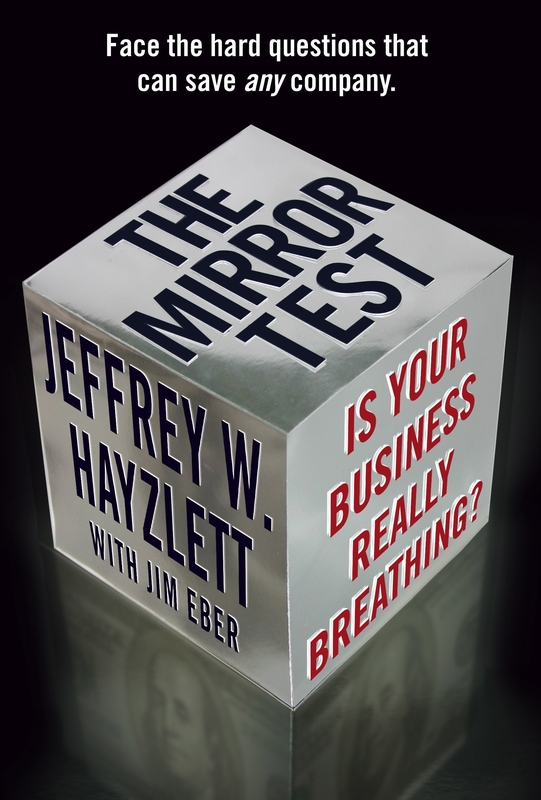 The Mirror Test: Is Your Business Really Breathing by Jeffrey Hayzlett was published by Business Plus on 5/1/10 – order it from Amazon here or from Barnes & Noble here – or pick it up at your local bookseller (find one here).